Tell us all about your city, country, state. Snow Day in Raytown Missouri! How much snow do you think we will get?? At the end of the day on Feb 1, 2011 we had a total of about 10 inches of snow. Tomorrow will be another snow day due the condition of streets and blizzard like conditions. The Snow Days continued through the end of the day Thursday Feb 3, 2011. 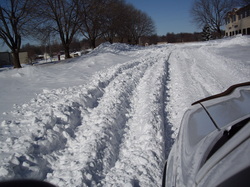 Getting around on roads were not easy, but the snow was fun for all of the students at home. Kennedy- They speak English and native Maori (Mauw-ree). Even though they speak English there are quite a few words that are different than us . . .for example candy is called "lollies" and they have crayons, which are very big but they also have "jovies" which are the normal sized crayons we would use. They call markers "felts". Isaiah- My school is named after the area it is located in, which is called Riwaka. It is very different than any school you or I have ever attended. There will be pictures soon on my website of my classroom, so K'vontaye and Leyah keep an eye out for pictures of the school! Michelle- great question! i plan to post pictures of the outside and inside of the house I live in on my website very soon! Crisitan- The class here has 30 students altogether. Kayla and Rashiya- Great question! I will count tomorrow and let you know! Laurelai and Derek - School begins at 8:55 in the morning and ends at 3 in the afternoon. My class does swimming in the morning, the the teachers have a tea time and the students play on the playground, lunch lasts for an hour and after the students eat lunch they are free to play on the playground when done. All lunch is eaten outside. The students have to bring their own lunch, and clean up after themselves. Isaiah- Great question! My host family has their own vegetable gardens and fruit trees, so we eat a lot of fresh foods. Motueka, the town i live in, is very small and surrounded by farms and ocean. All of our food comes from local farmers. I have tried roasted pumpkin, which is by far my most favorite thing, besides a cookie called "TemTams". They are a fudge covered cookie sandwhich with caramel in the middle. Shaquiera- Yes! Her name is Mrs. Sutton. She is very nice. Alfonsia- There are certain schools that require uniforms, but Riwaka does not. The students wear normal summer clothes, like shorts and sandals, or "jandals"
I hope that answered some of your questions for now! Hopefully, I will talk to you all very soon! Questions asked by Students in Raytown Missouri about the students in New Zealand. Kennedy, what language do they speak? Ivan, what is the name of your school? Michelle, what does the house you live in look like? KVontaye, what does the school look like? Cristian, How many students do you have in class? Kayla, How many girls are in your class? Rashiya, How many boys are in your class? Laurelai, What time do you have to get up to go to school? Isaiah, what kind of food do you eat there? Derek, how long is your school day? Leyah, what does the classroom look like? Shaquiera, does your school have a principal? Alfonsia, do they wear uniforms? This Blog is designed for our class in Raytown, Missouri share information with our Pen Pals from New Zealand. We are excited about communicating with students from opposite sides of the earth. CHECK IT OUT!